Vice Principals season two steps up the show’s game and while I understand why the series ended where it did, I wonder what a season three might have been like. HBO's half-hour comedy series Vice Principals was always meant to be two seasons long. Creators Jody Hill (Eastbound & Down) and Dan McBride (Pineapple Express) - who also stars – envisioned a feature film originally but then morphed the idea into a short-term television show. While the first season wasn't overtly funny and downright mean, the second season fairs much better with audiences and critics alike. Now that HBO has bid adieu to the 18 episodes, the complete series has hit stores on DVD this week. For those who only watched season one or neither season, now is the time to buy it and binge watch. In season one of Vice Principals, we meet Neal Gamby (McBride) and Lee Russell (Walton Goggins; The Hateful Eight), the vice principals who immensely dislike each other as both are vying for the head slot as their Principal retires. Unbeknownst to them, however, the school board brings in someone else and they find themselves suddenly teaming up to dethrone this outsider. Throughout the 9 episodes, we see them scheming while we learn more about each of them and their pitiful lives. In the end, we get a cliffhanger we never saw coming and a whodunit to lead us into season two. Season two begins with Russell and Gamby temporarily co-principals, a role neither relishes as they envisioned sitting on top alone. As the season progresses, we see Gamby's softer side and realize he has some semblance of humanity while Russell is evil incarnate. Even when we get a glimpse of kindness in him, it flashes by quickly and then is gone once again. Unfortunately, Russell is like the no good friend who constantly leads Gamby into to trouble time and time again. Ultimately, they each get the one thing they want, though not in quite the way they expected and hopefully they learned a little something along the way (well at least I'm sure Gamby did). Unlike Season one, the second season of nine episodes are decidedly funnier than the first, which is a good thing. We get some great moments, especially when Gamby fills in an attempts to teach Reconstructionist history with no knowledge base whatsoever. We also get to see Russell delight in the misery of others, which makes him even more unlikable than the first season (if that is possible). We also get a mystery, as Gamby tries to figure out (spoiler alert) who shot him at the end of season one. The show needed to change to draw in an audience and, luckily, season two does that. With the writing team, formerly headed by Hill, replaced, we get a very different show than before, which, as I mentioned, is a good thing. While season one was more of a turn-off, season two has more depth, and as mentioned before, more comedy. Once you finish the show, you may understand why McBride and Hill made season one so different. Luckily, the beginning didn't turn people off completely and kept them coming back for the better half this past year. The DVD comes with three discs and a Digital HD download. The extras include audio commentary, deleted scenes and a blooper reel that, unfortunately, isn't very funny (they generally aren't though). McBride and Goggins are pretty good and Goggins takes on the role of the proverbial devil a little too easily for my liking. The supporting cast, while rather superfluous, makes for a nice backdrop against our two leads. Season two steps up the show's game and while I understand why the series ended where it did, I wonder what a season three might have been like. Overall, not HBO's best, but if you can sit through season one, the pay off is worth it, mostly. 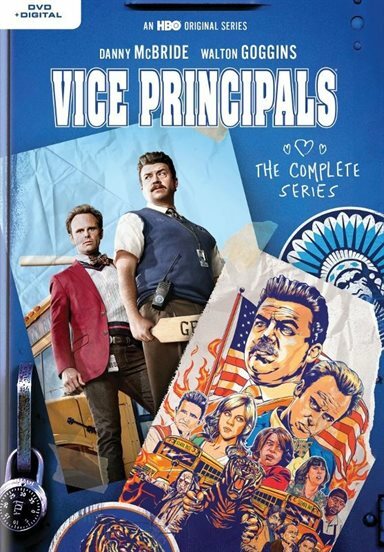 Download Vice Principals: The Complete Series from the iTunes Store in Digial HD.